Thanks to the support and encouragement of Dan Smigrod, I decided to compare these five processes on an Apples-to-Apples basis, by shooting one property 5 times. This post presents my first results. I'm going to be shooting more residences this way, because I'm curious to learn. I hope these experiments are helpful to you all. First a couple disclaimers. My experience for three years has been Matterport. All the rest are either brand new to me or in the case of Zillow 3D Home, I'm about two months in. So I want everyone to know that with almost all these systems I'm learning and flaws which may exist in the shooting or modeling may reflect my own skill limits as much as the system. However, for all of you who, like me, are MSPs, this may be useful if you're considering adding other capabilities to your services in order to serve a broader range of clients, whether more up-scale or budget. None of these spaces have extra features added such as Matterport's showcase tour. They are just plain vanilla walkthroughs at this point to put the emphasis on the basics of image quality and navigation. Also, I have no results yet from the use of Cupix which I believe is my own fault. I'm in communication with the Cupix team and working to master how shooting for Cupix is different. If they are patient enough to educate me, I'll be adding this in the future. For now, here are the other four. Rather than my commenting now, study them yourselves. I'd like to learn from your observations, and I'll add mine later regarding the time each took, both shooting and editing. This 2000 sq ft condo in Los Angeles was unfurnished, so it made shooting quite simple. However, it has a balcony which extends the full width of the apartment from living room to master bedroom, and which is VERY NARROW outside the dining room window. This was challenging as the cameras were less than 12 inches from the window which resulted in significant mapped image distortion in both Matterport and GeoCV dollhouse models. I want to point this out because I believe it's more an issue with the space itself than either of these systems, since they both struggled here. We all know that these cameras have issues at very close range, and recommend greater distance - I simply had no option. Explore and compare. I look forward to your comments. Watch out Matterport. I’m paying $149 a month and own two matterport series 1 cameras for the two guys that work for me. I don’t think I’ve ever exceeded my 11 uploads a month for the $149 (I think it’s 11 you get, please correct me if I’m wrong). If Geo is the same price or less (meaning I won’t have to spend more than $149 a month), then I’ll be eBaying the two black bricks. I think this is what a lot of us have been waiting for, someone with a lot more options and doesn’t want to control us as well as retain the copyright. Anton, if you ever consider an offer from Matterport, make sure it’s so much money that you can easily afford a 150 yacht as I think you’ll rule the 3D world. At $99 a month unlimited, I think 90% of MSP’s will jump ship, and rightly so. About time , been waiting for this moment very patiently. @Home3D Great job putting this together. I'm becoming more and more impressed with GeoCV. 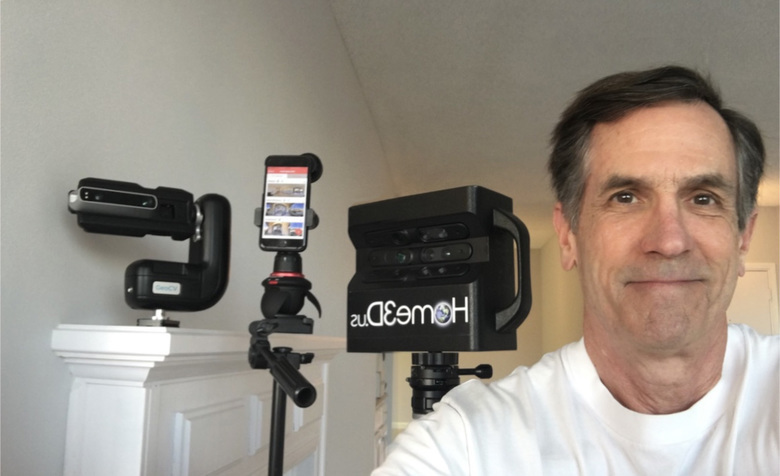 The restrictions and cost of Matterport is becoming an issue and I am leaning to the GeoCV platform. I've signed up for their beta program and am anxious to give it a try. One question I have is the quality and or availability of still photos from GeoCV. Any thoughts on that? I could see using GeoCV. I just emailed them for info. How much is this going to cost? Does it use an iPad like Matterport?? How does Zillow 3D home work? Do you become a provider? Is this only for Real Estate agents? Kevin here. Let me answer a few of these as best I can. @rzphotoman - I haven't yet figured out how to export stills or panos from GeoCV. @AntonYakubenko - can you explain? Also Anton, have you published cost, answer for @izoneguy ? GeoCV does NOT require an iPad. It's a completely self-contained system which cleverly combines a Samsung phone with a Structure Sensor (made by Occipital - https://structure.io/structure-sensor ) both mounted to GeoCV's computerized rotator / tilter base. A MP camera has three lenses and three IR sensors mounted level, angled up and angled down. It simultaneously captures these three angles both photographically and as IR point cloud data, and rotates through six compass positions to capture 18 views it stitches into a sphere. GeoCV's Samsung/StructureSensor combo is tilted and rotated by the motorized based, capturing a similar set of photos and data, but with eight compass positions instead of MP's six. These 24 sets of photos/data are then stitched to sphericals right on the Samsung, displaying a growing minimap of the space as squential scans are aligned. Since it rotates like MP, you can just stand behind it. There's no iPad to carry around. Only downside here is that the Samsung phone screen is considerably smaller, so harder to see screen details and "markup" mirrors and windows. But I found it quite easy nonetheless. If a position prevents you from staying behind the camera, no problem, as there's a few seconds delay from the time you press the "capture" button until the first of the 24 shots is taken. I found it easy to use this pause to zip out of sight. The full shoot cycle (camera rotation) of Geo is slightly longer than MP, but there is no "Downloading" time since the Samsung already has the shots and data. So, in the end, shooting with Geo is just as fast as MP. Another potential upside to Geo's system is that, in principle, the camera (phone) can be upgraded without replacing the entire rig. @izoneguy - Zillow's new app 3D Home (I wonder if they just liked my company name?) is available for anyone to use, today. Just download the iOS app "Zillow 3D Home" and go to town. It works with the Theta V and they are adding more 360° cameras. As several pointed out recently on the forum, there's nothing "3D" about it - the name should be "Zillow 360° Home". The app is in test market in 9 cities I believe, with nationwide roll-out expected this year. You put the Theta V on a pole-pod, stand it in the middle of each room, and snap a 360 from the app on your iPhone or iPad. Each shot is uniquely labeled as you take it, like "Kitchen". There's a preset list of room names, and the option to create others. When all the shots are collected, link the iOS device to Wifi and they automatically upload to Zillow's servers. When upload is done, you accept "Finish" and the servers crunch them into a tour. The amazing part is that Zillow has done an impressive job of engaging machine vision to recognize the connections between rooms. Consider a dining room and kitchen with a mere doorway between: this machine vision can recognize a small bit of counter and edge of a fridge through the doorway in the Dining shot and, in reverse, maybe a bit of a chair and dining table through the opposite doorway from the Kitchen shot - and CORRECTLY match the two scenes. I've found that about 75-80% of the connections are correct the first time, which means very little time needed in the editor to finish the walkthrough. Zillow's HDR is limited but passable. In the end, this is a very useful app for very quick, functional, walkthroughs. Just as Zillow Videos (launched with the idea Agents would do these themselves) have never become ubiquitous, I expect even fewer agents to devote the time for 3D Home which has more steps. But this is a solution which powerfully democratized 360 walkthroughs. What's also powerful about 3D Home is that, unlike Zillow Videos, it is NOT locked to Zillow. You can post a 3D Home on Realtor just like other URL-based assets. Zillow also intends to give listings using 3D Home a search boost, as they did for Zillow Videos. Let me add that what Zillow 3D Home does, NodalView does MUCH BETTER. It's machine-HDR is among the best I've yet seen (though still not like skilled Photoshop) and NodalView has many additional features beyond 3D Home. It also uses machine vision to assemble 360s into a walkthrough. It uses your own smartphone, fitted with a fisheye lens and motorized rotator to capture/assemble a set of stills into sphericals. The rotation cycle is fast, but still lets you stay behind camera, so no need to dash to the next room. Image quality is superb, color very pleasing (better than Zillow). IF (the unknown) Zillow gives a HUGE search bump to listings with 3D Home, they have some real leverage getting people to use their system. I'm inclined to think Zillow isn't smart enough to do this, and so 3D Home may languish on the sidelines like Zillow Video has. I'm torn, because on one side I'd love 3D Home to succeed in democratizing walkthroughs - good for the entire sector. But I'd hate to see it succeed so much that we have another VHS winning out over superior BETA tapes (yeah, I'm old enough to remember). If one format eventually "wins" it will be due to platform ubiquity, not quality, most likely. I hope it's a format with the most to offer, not just the cheapest/quickest. Time will tell. Thanks for those answers. I did a demo with Zillow 3D Home. I used my iPhone in my house. You really need a rotating head tripod to do this. Plus it wants to upload right after you shoot it. I don't see how this would be practical trying to get WiFi access in every house you might shoot? Unless you can upload it later? The results were OK but I think using a Theta V would make more sense. But yes the VHS-Beta war seems to be raging in 3D again. Actually I am encouraged because it seems that Virtual Tours will finally be a must have for business & real estate as opposed to a nice to have. I started producing videos in the 80's when video was nice to have. Now it is almost a requirement if you have any web presence at all. I recommend using a 360° camera for Zillow 3D Home. Yes, you can upload all the panos later - works fine. Theta V works today, I'm not sure whether they've yet added other cameras yet, but it's coming. Yes, I agree that all this innovation will ramp up wider adoption. I personally question whether VR will ever be widespread just because wearing a headset is socially isolating. You really want to sit next to someone, both of you wearing separate headsets? But walkthroughs on an iPad I think are engaging and seductive. @Home3D ...Thanks. This is a great conversation starter on the two platforms. Was the MAtterport model shot with a Pro1 or Pro2? I ask because the GeoCV model has a much crisper image, while MP seems a bit hazy. Is there an explanation or is there a real quality-difference in the hardware and rendering between the two? No not VR. I don't know anyone using headsets for anything (yet). I have seen VR used in museums and in Atlanta at the College Football Hall of Fame, even the VR demos at the NAB show in Vegas last April were lame. Most of the salespeople pitching 360 cameras had no idea how to sell because they did not understand the 360 market. I have done hundreds of conventional tours using the old pano head and fisheye lens. I was experimenting with the GoPro fusion but the 360 pics were not great. The video was OK but video 360 has limited applications. @Shakoure - very observant. Yes, the MP was shot on a Pro 1 camera, so that limits the still resolution. My clients all want separate, traditional stills via Lightroom and Photoshop so I still use the Pro 1. Kevin, thank you so much for the review! I'd like to mention that currently we shoot in SD resolution (6434 x 3217 per panorama) and 4x better HD resolution (12868 x 6434 per panorama) is coming soon. @rzphotoman - I haven't yet figured out how to export stills or panos from GeoCV. @AntonYakubenko - can you explain? We're working on this feature and it should be released relatively soon. Also Anton, have you published cost, answer for @izoneguy ? We'll be sending our pricing for the early adopters via email. @AntonYakubenko Following. My annual renewal period is coming up soon. I didn't sign up for GeoCV Beta but I am very interested give all moves Matterport as taken in the past. Your pricing and quality matter to me and I am guessing to many others too. I am looking forward to your WGAN Forum posts comparing the various 3D/360º Cameras/platforms. @Home3D - Thanks for posting all of this. It's pretty clear, GeoCV does a fabulous job compared to the Matterport Pro-1 camera. 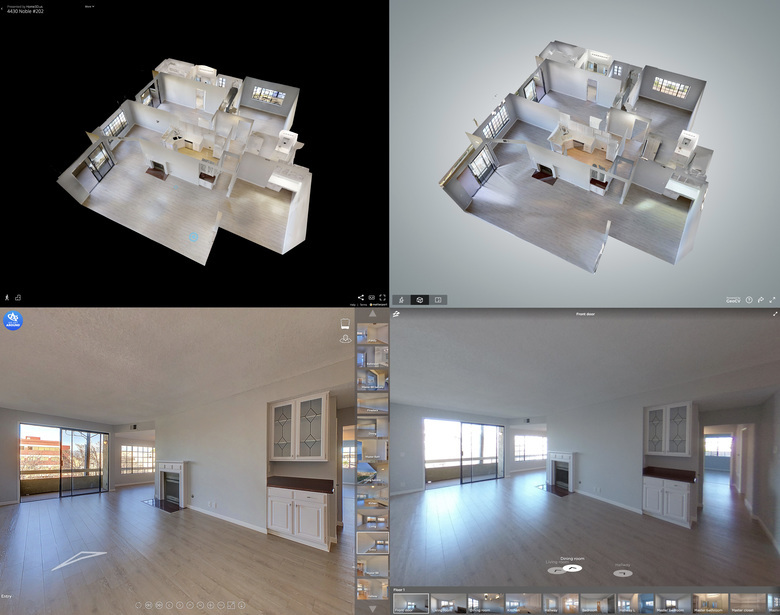 Not a fan of the Nodal View or 3D Home tours -- pretty sad when compared with the two 3D platforms. Can't wait to dig into GeoCV myself. Looking forward to a lot of the features on the roadmap. @Home3D - great show Kevin. Thanks. For the next round it would be great to see MP Pro 2 in the list for fair comparison. GeoCV finds scope with HDR improvement.... as know it takes 5 exposures each shot but I see it still lacks the clarity against Nodal - both in terms of sharpness and HDR. Does GeoCV make use own capture app or uses built in camera app from Samsung? 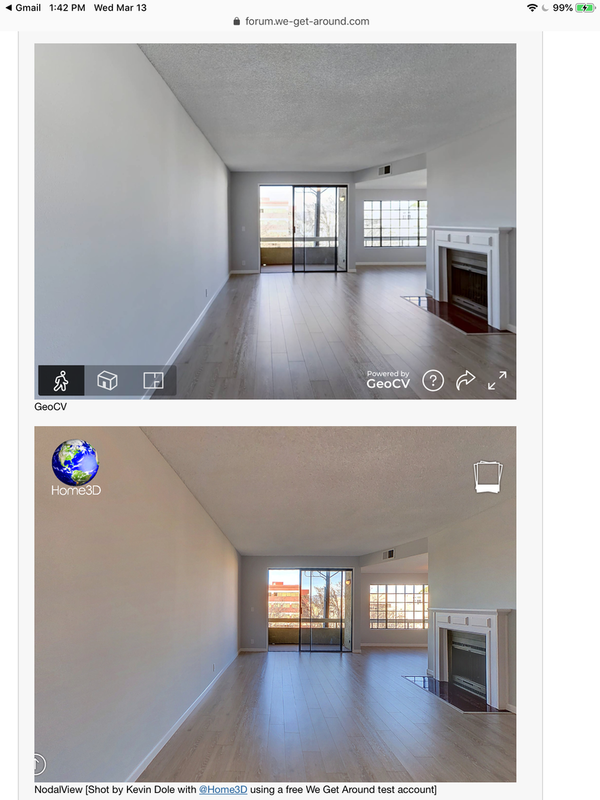 @Kumar - GeoCV has it's own Capture App that is similar to Matterport's Capture. It's a 3D System, so you must consider that if it were to use Samsung Camera software, there would be no 3D, no alignment, etc. Concerning the difference between Nodal and GeoCV in the above image -- this is a good example of where Nodal produced a better result -- but if you look at other images, the results are not as consistent. Are the NodalView images manually processed, or all automatically processed? At the end of the day, I don't understand is why we compare panorama makers to 3D Camera systems ... are WGAN members really interested in panorama systems? If so, just get a DSLR with a fisheye lens, a Nodal Ninja, and a copy of Pano2VR or 3D Vista. We're professionals, right? Respectfully, I disagree with you. The question is not do we as service providers like a 3D Tour or 360º Tour better, it is what does the client want. While the Nodalview Tour I shot (above) is a 360º tour, it is excellent at visually telling the story of this beach condo. The magic of staying at this beach condo is the view of and on the beach: particularly sunrise and sunset (picture). While the tour does not have a dollhouse view, it is easy to shoot. Easy on post production and likely can be priced below a 3D Tour (because of speed of capture). If it is "good enough" to make the sale, we should be comparing 3D Tours and 360º Tours. As someone whom previously shot 360ºs with a DSLR and a fisheye lens (along with PT Gui Pro and Pano3=2VR), I can appreciate the quality of the imagery and control over stitching. That said, not something that I want to ever go back to and for 360º photography to grow exponentially, it needs to be a 360º 1-click camera. Every month, it seems like we see either new 360º 1-click cameras or firmware upgrades to improve the HDR, etc. @DanSmigrod - spelled my words right there. We do got contest 360 pano services on ground. No doubt the feature set of 3D tour out weigh them but visual quality is something people are sold at first. That said, we are clear on what we are pushing to clients - 3D tour it is. If upgrade of cam to GeoCV is one of option? Capture app - I understand it's a dedicated app that is used to capture 2D and 3D. I was trying to understand if there are added layers to control how an image is captured as against default camera controls. - I admit that as any fully automatic software solution, our system sometimes performs better than other times. We're constantly improving our image processing engine, so over time it becomes even better quality imagery in an even more robust fashion. - We often perform blind reviews of the results of our automatic processing involving hundreds of people. We compare both progress of our new versions of our automatic processing vs previous versions, as well as comparing against some reference results, e.g. manually retouched photos. So our development is driven by feedback and has some benchmarks. - We knew that beforehand and our blind tests have proven, that "image quality" is a very subjective parameter, there is no one size fits all solution. The only way to solve this is to give more control to our customers, such as ability to tune parameters or select presets, and eventually learn from this input for each particular customer to perform further adjustments automatically. We're not there yet, but that's the longer-term intention. - We've started from a high-end New York City market, which has very particular expectations for image quality, which we made our best to satisfy. We understand that different markets might have difference preferences on visuals. So now some of our images might seem for example too bright, while more realistic darker images perhaps won't be accepted by high-end agents to the best of our knowledge. - Nonetheless, we're currently adapting to the differences of the US market as a whole in comparison to NYC market alone. Moreover, I believe that with international scale we might need to have different styles for different regions, such as expectations of a Scandinavian client might be very different from the expectations of a Chinese client. - By using our Creative Package, our customers can download highest resolution 360 panoramas, edit them and upload them back. So you have always an option to adjust the colors in a unique way you want. Batch processing in Lightroom, Photoshop or similar software would allow you to this efficiently. @AntonYakubenko - What you say here is fantastic. Working to add future customization of image preferences for processing panos, and also the ability to download and user-customize the panos, are both spectacular capabilities. Just that you are working toward these while already providing service custom branding and so many other benefits, makes GeoCV an ultimate high-end technology. MP seems to have always believed that RE agents are their ultimate market. Why else spend so much effort trying to sell them cameras? Considering the incredible simplicity of Zillow Videos, and how few agents use them after two years, it's clear that MP and all walkthrough presentations are likely to remain the work of dedicated photographers for the foreseeable future. MP may have a significant lead in the market, but they can lose market share if they target cannibalizing MSP's customers. One wonders if they take MSPs seriously. Thank you, Anton, for your efforts to build a platform which does it all for us. @AntonYakubenko ...Very thankful & humbled that you - as co-founder of a direct MP competitor - make the time to engage with 3D spatial photographers on WGAN. If only MP would have a c-level or VP person on this platform to engage members in dialogue and answer questions. That level of inter-personal connection will take you a long way. Thank you.